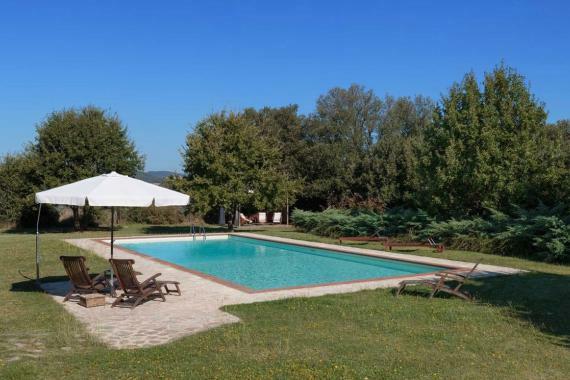 Holiday villa Elsa lies in the Tuscan hills near Casole (15 min.) with restaurants, bars and shops. .This wonderful villa comprises 2 floors and has its own tennis court. On the ground floor there is a spacious living room with fire place and access to a covered terrace with comfortable outdoor furniture. There is a dining room with piano and a fully equipped kitchen with access to a terrace with dining facilities. Furthermore on this floor a laundry room with washing machine, a guest toilet and three double bedrooms, 1 with en suite bathroom, the other 2 share a bathroom. On the first floor there is another sitting room, 3 double bedrooms and 3 bathrooms (shower). Wonderful views across the Tuscan countryside from the covered terrace on this floor. Villa Elsa sits in a large well-tended garden with lovely swimming pool (16 x 6) surrounded by a terrace with sun beds and parasol. There is a small fridge, a BBQ and a pizza oven. Villa Elsa has its own hard court tennis court. Holiday villa Elsa is for rent near Casole in Tuscany (Italy) with restaurants, bars and shops. Casole: 15 min. by car. Volterra: 20 min. Siena: 50 min. San Gimignano: 45 min. Tuscan coast: 1 ¼ hrs. Airport Pisa: 90 min. Airport Florence: 1 ¼ hrs. Airport Rome: 3 ½ hrs.